POITOU, FRANCE – We pause. We take a deep breath. We cease our normal sarcasm and kvetching. Today, we give thanks to the global elite… the people to whom we owe so much. After printing trillions out of thin air, the Fed has blown bubbles in the bond market, the stock market, and student loans, just to name a few. All of these bubbles are combining to create what Doug Casey calls an “Everything Bubble.” And when it bursts, he says there’s one type of investment that could soar higher, faster than anything else. For the full details, click here. 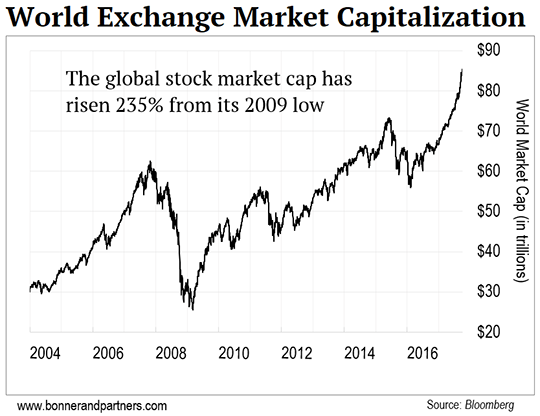 We’ve never had it so good: Global equities now worth $84.8trn, highest value ever in history. Equals to ~110% of world GDP. America’s top 1% now control 38.6% of the nation’s wealth, a historic high, according to a new Federal Reserve Report. The Federal Reserve’s Surveys of Consumer Finance shows that Americans throughout the income and wealth ladder posted gains between 2013 and 2016. But the wealthy gained the most, driven largely by gains in the stock market and asset values. The top 1% saw their share of wealth rise to 38.6% in 2016 from 36.3% in 2013. The next highest nine percent of families fell slightly, and the share of wealth held by the bottom 90% of Americans has been falling steadily for 25 years, hitting 22.8% in 2016 from 33.2% in 1989. Wait a minute… How much income do you need to be in the top 1% of earners in America? We looked it up. If you and your spouse earn $343,927 or more, you’re there. Hallelujah! And yippy tai yai yay! Those book royalties pushed us over the top. It’s great to be in the 1%! Break out the party favors. Pop the champagne corks. Open a Swiss bank account. Oh… and don’t forget the people who made this possible. Contact your congressional team. Be sure to make a contribution to their re-election campaign fund… and book a night or two at Trump Tower Hotel, while you’re at it. Through no fault of our own – indeed, in spite of our best efforts to avoid it – we are a member of the “One Percent”… the rich… the capitalists who exploit everyone else so that they can enjoy lives of luxury and self-indulgence. We are blameless, of course. It just happened that way. We went to work in the financial sector in 1979 – just eight years after President Nixon severed the last ties between the dollar and gold. How were we to know that the feds were going to make us rich? But that’s what they did. Since the start of the 1970s, using their fake-money system (which even they didn’t understand), they have aided and abetted about $35 trillion in extra credit creation. This is the amount of credit beyond what we would have today had the ratio of credit to GDP remained where it was during the preceding decades. That’s debt above and beyond the amount that the economy would normally support. There were ups and downs, but in the 1950s, 1960s, and 1970s, the U.S. economy was more or less healthy. Marginal tax rates were high. But the feds mostly minded their own business, and their effect on the economy was contained. Then the Deep State cronies got control of the system. The zombies multiplied. Debt increased. Tax rates were cut. And GDP growth rates and real wage increases declined. By the end of the 20th century, debt had become a major problem. Consumers were tapped out. In 1929, when the masses were swept up in the stock market craze, a Wall Street legend named Bernard Baruch went for a shoe shine… That’s when the man shining his shoes started giving Bernard stock trading advice. After his shine, Bernard walked back to his office and immediately SOLD EVERYTHING. Shortly after that, the Great Depression hit. He knew that if the shoe-shiner was giving him stock advice, the market was at peak hysteria and was about to crash. We’re in a similar situation now – the masses are hysterically piling into the market causing it to be one of the most overvalued markets since the Great Depression. If you’re smart, you’ll ignore the herd and CLICK HERE instead, to learn about a contrarian investment strategy that the masses don’t even know about. And sure enough, twice over the next decade – in 2000, following the dot-com excesses, and again in 2008 – markets tried to correct. And twice the feds prevented it, each time lowering interest rates to prop up existing debt. Between 2000 and 2004, the Greenspan Fed dropped short-term interest rates from a high of 6.5% to a low of 1%. The Bernanke Fed repeated the trick in 2009… this time taking rates all the way down to zero. What was the effect of lower bond yields? If you have a lemonade stand earning $1,000 a year, for example… it’s worth $20,000 when interest rates are 5%. That’s how much capital you need to invest in less risky bonds to equal the income you’d get from the lemonade stand. When interest rates go down to 1%, the lemonade stand is worth $100,000. That is why the rich are so rich. Here come the feds to the rescue again. They’re offering a tax cut for the middle class. Not for us rich guys. No way! Under Team Trump’s tax plan, our business income, currently taxed at 35%, would be taxed at 20%. Hey, that’s good news for us. But how does that help the middle class? The Tax Policy Center, a nonpartisan think tank, calculates that the plan could add $2.4 trillion over the next decade to the national debt… and that the biggest benefits will flow to businesses and the wealthiest Americans. In fact, it found that roughly 1 in 3 middle-class Americans could see their taxes go up due to proposed changes to the deductions and exemptions. Hey, another win for us, the “One Percent.” Isn’t that great? Dear readers are invited to write and tell us how happy they are for us. Just hit reply to this email to send us your thoughts. Global stocks have recovered their 2008 losses… and then some. That’s the message of today’s chart. It shows the value of all outstanding global shares as tracked by Bloomberg’s World Exchange Market Cap Index. As you can see, $32 trillion was knocked off the value of world stocks, peak-to-trough, during the 2008-09 crisis. But since its March 2009 low, the value of global stocks has risen 235% and now stands at more than $84 trillion. As Bill referenced above, that puts the total value of all global shares at about 110% of global GDP ($78 trillion). Last month, more than 140 million Americans were the victims of a massive cyberattack when credit rating agency Equifax was hacked. Now, Bill’s chief technology analyst Jeff Brown has a warning: This is just the beginning. When super investor Warren Buffett makes a big move, the rest of the market takes notice. Now, Buffett’s Berkshire Hathaway just made one of its biggest deals in 2017, and it’s in a surprising sector. Thoroughly enjoyed today’s missive as I usually do. I have something to offer as a result of what I read therein. You mention that tax cuts will do nothing for the middle class without equal spending cuts, and this is LARGELY true, and I have been screaming the same thing – just as I was back when Reagan cut taxes and increased spending and set us on this one-way street. With this, I offer a thought experiment: I claim that there is one instance wherein a tax cut with or without spending cuts COULD help the middle class. End corporate taxation. Yes, that’s right, end taxes on the rich. No, you do not need to adjust your screen, and no, that is not a typo. End corporate taxation and let the rich make their money in the United States again. With zero taxation, they could move their factories back to the U.S. In doing so, the middle class could find jobs again. This would help the middle class even if Washington keeps spending like sailors on shore leave. No, it will not fix the deficit, and the economy will still come crashing down, but between here and now, Americans could go back to work. But most hilarious is the fact that there is no proposal to end corporate taxation in the Trump plan… the ONLY tax cut that could possibly help them. And so our destruction continues. Bill, that doesn’t follow. If more people pay tax at the lower rate, because they are less incentivized to cheat, or because more people are in work and contributing, then what you say may not be true. Tax revenue WILL go up. On the topic of tax cuts, you mentioned an estimated $2.5 trillion revenue shortage. If even a small part of that is money retained by the middle class, that’s a win. I have always considered cutting taxes as something other than a gift to the taxpayer. It’s simply allowing them to keep more of what they earned. If the government ends up with $2.5 trillion less than the year before, that’s a good thing. They’re going to spend it anyway, whether they have it or not. Maybe Congress will buck up and cut spending to match the reduced revenue. I can dream, can’t I? I believe your recent Diary essays on Trump are a bunch of BS. Trump doesn’t know how to conduct himself. He made us the laughing stock of the world. He is a lying, egotistical, racist president. You need to open your eyes and ears so that you can see and hear what he is doing to our country and hear the BS that comes out of that mouth. Trump does not care for the citizens of the United States. He wants to be like his friend Putin and run this country with a one-man government. Trump doesn’t have the brains to run this country on his own. He’s got the Generals pulling the strings. Please! God help us all!! Your recent Diary, “Why Donald Trump Is President,” is a thoughtful message about the reality of what is being foisted on us as “progress.” Expanding theories from single data points make me shudder. But “higher education” is graduating more lawyers than engineers. That seems to qualify as the residue of a failed system. The general population thinks this is “good.” Accountability and responsibility have disappeared into the dustbin of history a while ago. That’s the message from our friends at Casey Research. 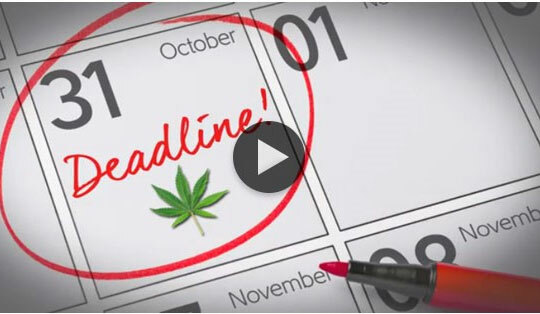 On October 31st, Canada will vote to legalize marijuana for the entire country. When that happens, this 58-cent pot stock could soar. Details here.